In most of our reviews, we make the main image of the figure the exact size of the toy itself, so you can tell how big something is without having to wonder. This time? We're not doing that. The SHIELD Helicarrier first appeared in 1965's Strange Tales #135, along with SHIELD itself. It's been redesigned many times over the years, but the basic intention has always been the same: a flying aircraft carrier/headquarters. In-universe, it was designed because SHIELD didn't want a stationary headquarters that would be subject to attacks from their enemies - so instead they got one that writers would crash out of the sky whenever they wanted to make their story seem important. The normal mass-market release of the Helicarrier was already a pretty sizeable toy, but this is the SDCC exclusive, and it takes things up a notch. From stem to stern, the toy measures 46" long - just a bit under the 4' length claimed in all the press releases, but that's okay. It's still a massive, unwieldy toy (even if it is way smaller than the USS Flagg). The extra length comes from an extra section of deck that's inserted between the two main halves. Yes, the SHIELD Super Helicarrier works the same way as your grandmother's table at Thanksgiving: you pull it apart and put a leaf in when you've got company coming over. Just that in this case, "company" means "the Avengers," rather than your uncle and the stupid things he believes. The size may not be ideal for 4" figures (honestly, the Super Helicarrier is sized more for Micro Machines than for figures), but the details are very nice. Rather than being a smooth, featureless slab, there are lots of small details that add up to make this look like a real piece of technology. Have you ever seen the deck of an aircraft carrier? It's not as seamless as it looks on tv. There are sculpted hatches and rivets, and tie-down points to keep the jets in place when there's a storm. 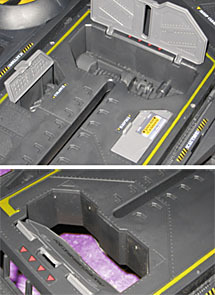 Three compartments on the front half of the deck open, revealing an engine compartment and two weapons storage lockers. There's also a "trap door" panel up there, but it doesn't have any kind of trigger - we guess you're just supposed to hit it hard enough to make whoever's standing there fall through. There are four guns on the sides of the normal Helicarrier, and the extra section in the Super Helicarrier adds four more. There's a giant cannon hanging off the starboard side of the command center, with a seat so someone can sit there and fire. Really? Who's going to want to ride outside on the Helicarrier? That seems like a bad duty to draw. The cockpit itself has two opening hatches: one to seat a pilot, and the other to provide an observation point. 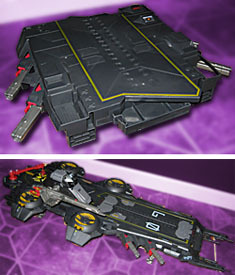 Again, this is much smaller than an in-scale Helicarrier should be, but you get what they were going for. 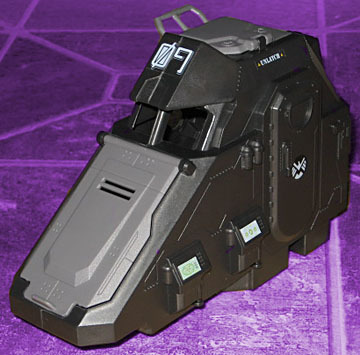 The entire thing pops off the ship, too, forming what Hasbro's website calls a "removable assault pod," suggesting it can fly around by itself. Sure, why not? There's a large system of gears sculpted onto the deck next to the control tower, as well, making it look like it should be able to rotate to the side for some reason. Not sure what that's all about, but it does make a nice spot of detail. 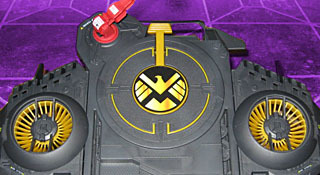 The regular release of the Helicarrier is molded from a blue plastic, while this one is dark grey - a much better choice. The inexplicable crane on the back corner is red, and the SHIELD-logo catapult is yellow. So are the turbines that lift the Helicarrier into the sky (not for real, though, because some killjoy out there did the math and declared that the Helicarrier wouldn't be able to fly; apparently flying, one-man suits of armor are perfectly reasonable, but a skybound boat is just too much to bear). The set includes a sheet of stickers to finish off the details: lots of "no step" and "stand clear" decals, but also things as prosaic as a fire extinguisher and a first aid kit. 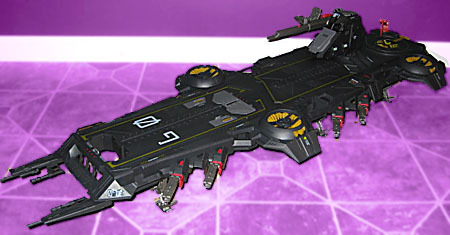 The Super Helicarrier is also number 09, rather than the number 67 you can get at mass retail. Neither of those numbers seems to mean anything - the Avengers first appeared in 1964, the Helicarrier in '65, and the movie in 2012. So what are 67 and 09? The Super Helicarrier has three removable pieces of landing gear that plug into the underside of the ship. They hold the carrier at a nice height, but the ship itself is ridiculously thin. Think about how tall an aircraft carrier is - the Helicarrier should be the same. This is like a platform on stilts. It's got no "below decks" area! It's cool that there are Stark Indistries logos underneath there, but some depth would have really helped make this seem like a better value. If you buy the mass market Helicarrier, you get a movie-styled Captain America with less articulation than usual. Yes, it's just like the GI Joe toys, where the vehicle drivers get fewer joints. 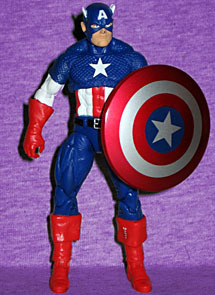 If you sprung for the SDCC version, though, you get a fully articulated comic-style Cap. Okay, it's just the same figure from the International Patriots box set, with the shiny shield that Bucky carried in his Walmart two-pack, but it's still better than nothing, right? Besides, it's not like anyone was buying this set because they wanted Captain America. He's the sideshow, not the main attraction. Rather than just coming with one figure, this release comes with two, and it's the second one that finally convinced me to buy it. 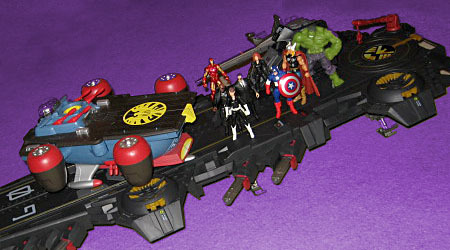 In addition to Captain America, the Super Helicarrier also comes with Maria Hill. A relatively recent addition to the comics, Maria Hill was named director of SHIELD after Nick Fury effed up with his whole "Secret War" thing and had to go on the run. She was eventually replaced by Tony Stark, and became his deputy director. 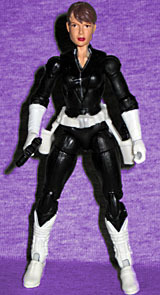 Maria uses the same body as Black Widow, which really converts to a SHIELD uniform very nicely! It's just a matter of pure black instead of dark grey, with white on the boots and gloves - she even has the same SHIELD logo on her shoulder. There might be some complaints that there are cutouts sculpted on the back of her hands that have been painted in, but you won't hear them from us. This is a great way to make a SHIELD uniform. Since I apparently wasn't paying enough attention before Comic-Con, I was expecting this to be the movie version of Maria Hill - you know, Aunt Robin. But no, this is just the comicbook version of her. Well, maybe. The face could definitely be interpretted as Cobie Smulders if you choose to, but it's not as strong a likeness as you'd expect. Comic Maria has black hair, though, and the toy has brown. Guess it's up to you which one she is! The standard release comes unassembled, just pieces dumped unceremoniously in a box. This one, however, is presented mostly whole (you just need to attach the landing gear). It took me half an hour to undo all the twist ties holding the damn thing in place, but they are the paper kind Hasbro uses, so it could have been a lot quicker - I was just curious about how long it would take to do it the hard way. The back of the box has a big piece of art by Joe Quesada, that shows Cap, Maria Hill and Iron Man fighting the Masters of Evil - with the unexpected additions of Whirlwind and Goliath (Erik Josten, not Bill Foster). Did Quesada pull that out of nowhere, or were there at one point plans for a Whirlwind/Goliath "Giant Battles" two pack to serve as a companion to the Masters of evil set? That'd still be cool, Hasbro. The SDCC-exclusive Super Helicarrier sold for $130, plus whatever it cost for Rustin to ship it all the way across the country to me. And honestly, it's not worth that. I paid more than I should have, even with all the bonuses this one has over the regular release. But the regular version retails for $70 (except at Walmart, who're weirdly charging $88.89 for it), and that's an even bigger ripoff! So really, they're both overpriced, but the Super Helicarrier feels closer to being worth its price than the Helicarrier feels to being its; does that make sense? I overpaid, yes, but I don't regret my purchase.